the Vedic personification of Sun. The Sun is the parent body of the solar system. The Sun rules over the sign Leo and it's exaltation is at 19 degrees in Aries. The Sun has no latitude, being always in the ecliptic and is never in the inferior state. The Sun co-operates sympathetically with all the planets except Saturn, it is temperately hot, dry and masculine and can be good or evil depending upon the configuration of surrounding planets. The Sun is the centre and giver of all life and as such, he is the backbone of the whole system of astrology. The Moon is the giver of form and consequently the conjunction or opposition between the Sun and the Moon is malignant in the physical plane, or the same when in parallel of declination. The relationship of the Sun and Moon largely determines whether life can be expressed harmoniously or not. If the aspects are friendly, our individuality and personality are in harmony and we are not confronted with the much opposition, while there are conflicting or adverse conditions when the Sun and Moon are unfriendly or parallel to each other. When the Sun is strongly placed in a horoscope, particularly in it's own sign of Leo, in rising, the native has a large, long strong body, piercing eyes and is physically well-built. He has a broad, high forehead and light curly hair. If the Sun is in a favourable position, the native is of noble disposition, proud, magnanimous and generous. He is humane, affable and a generous enemy. If the Sun is debilitated, the native is foolishly proud or vain, arrogant, troublesome, stubborn, superficial, restless and uncharitable. When the Sun is dominant, one's will is strong and one possesses a masterful character. The confidence given by self-respect and a cheerful outlook toward life, will allow the native to attract much good fortune. However, the native may find it necessary to guard against being too frank and outspoken and it may be advisable for him/her to cultivate caution and secretiveness. Such persons must also check their fondness for attention which may, if unchecked, turn into exhibitionism. When this planet is strongly placed, the concerned individual possesses the skill to look into mysteries of life, to make a study of nature's finer forces and is also endowed with the power to rise above the stature to which they were born. Others will turn to them for counsel and assistance. Many persons holding top official positions or those of high executive positions are born strongly under the influence of this planet. However, one's sphere of influence will decide the degree and type of success attained. The native of this planet is easily led, but they can also be very stubborn and difficult to manage if they feel that they are being imposed upon. The Sun, represents the constitution, life's principles and the true character of the concerned individual. When the Sun's influence is strong, it enables the native to reap the rewards of other favourable planetary aspects. Conversely if this is not the case, the individual has to suffer and endure the consequences of adverse influences. Where the Sun is weak, the benefits of other planetary influences is sometimes not enough to counter the affliction. The Sun governs the heart, the arteries, the eyes and the retentive faculty. The Sun rules organic troubles and the Moon functional disorders. In Sanskrit the Sun is called 'Surya' and this name is used in Vedic astrology. The Sun is the king of the solar system, and represents the soul. The Sun signifies power, authority, royalty, courage, confidence, influence, honour and fame, dignity, self-reliance, boldness, kind-heartedness, success, optimism, good health, practicality punctuality, righteousness, industry, and the source of all vital energies. The Sun represents the soul. It is the lord of the zodiac sign Leo and is exalted in Aries, and debilitated in Libra. The Sun causes diseases related to the heart, lungs, eyes, vital organs, fainting, palpitation of the heart and weak eyesight. It represents copper and the corresponding gemstone for the Sun is ruby. The corresponding colour of the Sun is red, pink and maroon. 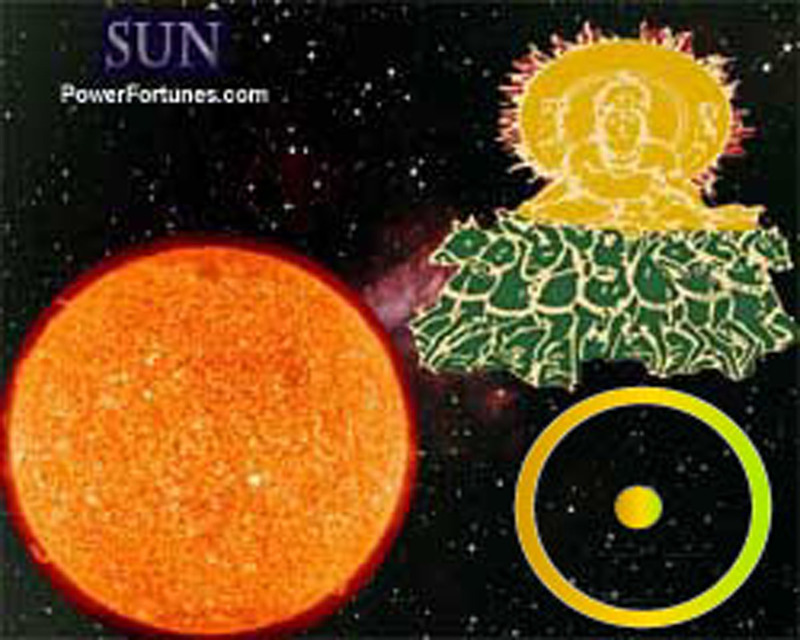 According to numerology, Sun's number is '1'. It is the lord of south-east direction, minerals and summer. It is steadfast and constant. The direction associated with the Sun is, East. The corresponding talisman for Sun is the 'Surya Yantra'.